Paul Evans created several innovative production techniques resulting in a distinctive set of aesthetics. Instead of producing a singular signature look, he constantly experimented and refined his designs. He avoided narrowly branding himself in order to introduce a variety of individual, contrasting and varied pieces, while maintaining the highest degree of quality, regardless of size or the material used in the construction, whether it was a one-of-a-kind commissioned piece or produced for his Directional Furniture Line. 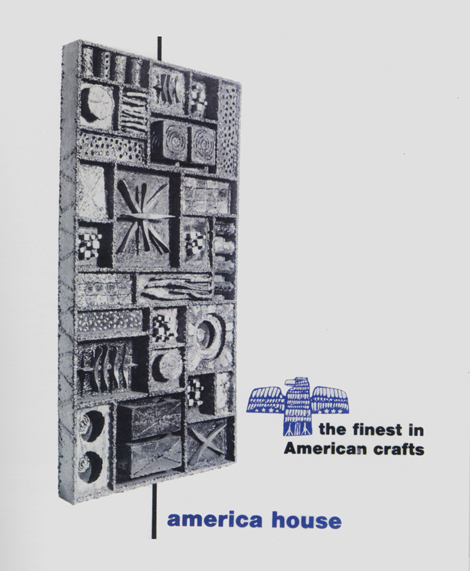 Sculptural panel by Paul Evans featured in an American House catalog, c. 1965. Image courtesy of Dorsey Reading. The present lot is exemplary of Evans’ most compositionally diverse surface, the sculpted steel front cabinet featuring a variety of texture, color and pattern. Approximately only 75 of these cabinets were produced, making them the rarest of Evans furniture designs. These sculpted steel pieces also included decorative panels and room dividers. Each one was made with custom-designed, hand-forged elements, abstract motifs and shapes. Each part was painted with a different oil-based pigment then treated with heat and acid. The result was colorful and gave the pieces a rough, textured appearance. These small fragments were then welded into a boxlike set of vignettes. When seen together, in a completed cabinet front, the assemblage comprises a façade with depth and variety. The surface becomes a sculptural fabric, a tapestry. The color palette for these pieces, while thematic, varied depending on the season. Evans collaborated with Robert “Cool” Thomas Sr., his finishing specialist on the steel front cabinets. During each season the two men would visit the expansive fields near the Evans studio and note the colors and textures they saw in nature. “Cool” with a painter’s eye, worked with Evans and interpreted what they had seen as he treated and painted each object in the façade. 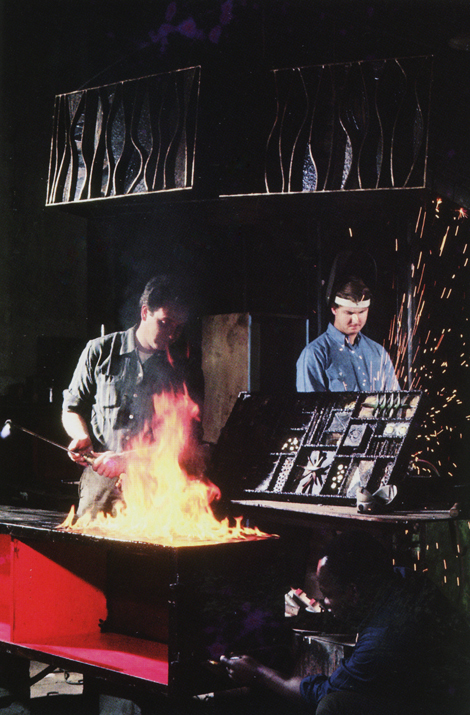 Paul Evans, Dorsey Reading and "Cool" applying patina to a sculpture front cabinet, c. 1966. Courtesy of Paul Evans. Among Evans’ divergent approach to creating different surfaces, each aesthetic, while incomparable, shares one common feature: A rhythm and flow whether the pattern is swirling, askew or at right angles. Also, with every surface treatment the process, technique and effort appears deceptively simple. 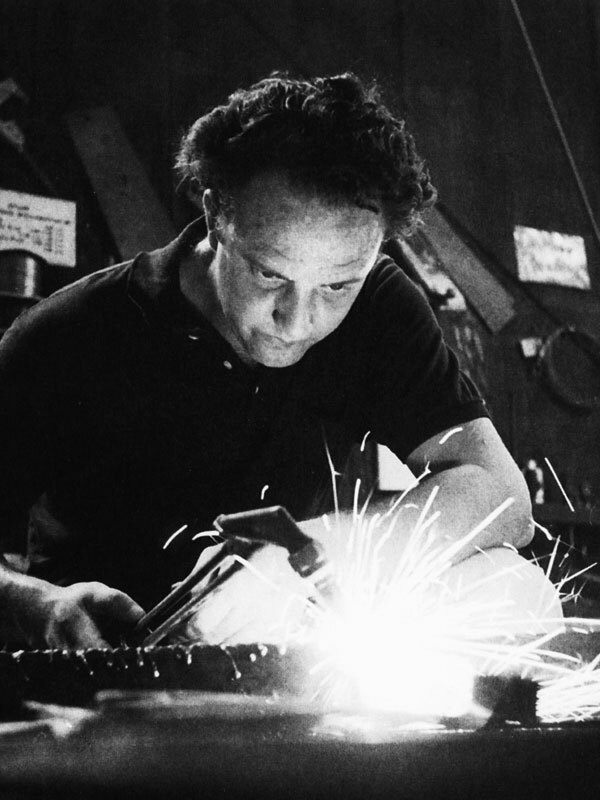 Metalwork has been one of the neglected areas in American design, and has been unfortunate in being controlled by traditionalists in its design, and by the taste of large scale commercial producers who have demonstrated little interest in contemporary form.